How Long Do Dental Products Last? The dental products that you use at home are your first line of defense against preventable oral health issues, such as tooth decay and gum disease. If they are expired, they may lose some of their preventive abilities, placing your dental health at risk. Depending on the product, you may be able to continue to use them for a short time even after they have expired. Unopened dental floss should never expire. It will not lose its effectiveness as time passes, but it may lose its minty flavor. If it has been opened, you will not want to use it if it has been sitting for a few months. Dust and bacteria can accumulate on it, which can be harmful to your dental and general health. 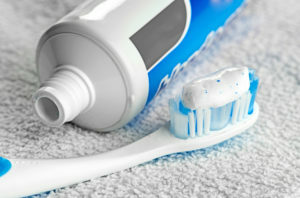 Even if your toothpaste has expired, it is often safe to use if you are within 2 years of its printed expiration date. After this time, the flavor and the power of the fluoride will start to fade. As a result, it will not protect your teeth as well because it will lose its plaque-fighting capabilities. An unopened toothbrush should never expire despite the date printed on it. After you begin to use it, you should get a new one about every 3 to 4 months. Its bristles will become worn from daily wear and tear, making it less effective. Not to mention, it may have high levels of harmful bacteria. There are times when your toothbrush may need to be replaced sooner, such as after an illness or when it starts to look worn. Ideally, you do not want to use a mouthwash that is 2 to 3 years past its manufacture date. Since most contain alcohol or other antiseptic properties that are mixed with a high amount of water, the antiseptic properties will start to dissolve. Eventually, you will be left with mainly a minty flavored water that will not kill bacteria. Although many dental products are safe after their expiration date, if you are ever in doubt, it is best to throw them away. At Advanced Dental Treatment Center, we maintain a high focus on prevention to keep your teeth and gums healthy. In addition to the services you receive from our office, the products you use at home are equally as important. If you have any questions about choosing the right ones for your needs, contact our office to speak to a member of our team.